The Globe has reported that Mayor William Lantigua of Lawrence is the target of a probe by federal and state authorities for possibly using city business for his own profit. 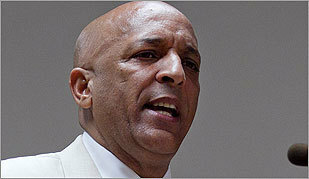 Lantigua has denied wrongdoing. Antonio Arevalo, a prominent Lantigua critic, said he was beaten by a 6-foot-9 nightclub bouncer who called him "a snitch." Here is a copy of the police report on the incident. Lantigua's live-in girlfriend, Ortega works at Lawrence City Hall. Despite the couple's combined income of $145,000, the Eagle-Tribune newspaper reported that Ortega accepted federal fuel aid to cover heating bills at the condominium she shares with Lantigua. Lantiguas wife, Mayra Lantigua, sits on the Lawrence board that determines which businesses are allowed to serve alcohol. Lantigua has grown close to the citys growing number of nightclub operators frequenting the clubs. Under Lantigua, the city's police chief has seen a reduction in officers, and had to disband the antigang unit. Lantigua upset some in the police department when he installed Bonilla, his former campaign manager, as the new deputy chief. City Councilor Daniel Rivera declared victory over Lawrence Mayor William Lantigua, with a slim margin of victory. The state attorney general and campaign finance regulators are suing Lawrence Mayor William Lantigua for allegedly accepting thousands of dollars in potentially illegal cash and corporate contributions. Tucked inside a birthday card for Lawrence City Councilor Marc LaPlante was a crisp dollar bill, no explanation, and no handwritten message. Lawrence Mayor William Lantigua has repeatedly failed to list who paid for his many fund-raising events.